Six people showed up for the game dubbed "Cylonnukah" by Matt (who, ironically, couldn't come to play). We played with the Pegasus expansion and the Kobol destination, with only a minor house rule for Cain which didn't even matter since she Blind Jumped without scouting. Krista and Man Ching were newbies to the game; Ben had never played with Pegasus components before; this was my first time playing a Cylon Leader. It turned out that both of the hidden Cylons had been Cylons since the beginning of the game. Just total coincidence that they were the most experienced players with this setup at the table, so they played it well. Early on, I got a chance to look at the Admiral Or President's loyalty card, so I took a look at Cain, and honestly said that she was Not A Cylon. I figured nobody would believe me either way, even though I had a supposedly "Sympathetic" agenda. A few turns later, a crisis came up which ended up sending Cain to the brig. In an unusual turn of events, Baltar fessed up to spiking the check. His justification was that since I'm a Cylon Leader, I'm obviously lying. The Cylon Attacks were piling on, but the fleet didn't have much trouble jumping ahead of them. Especially due to Cain's blind jump, which took them 2 distance at a cost of 1 population (if I remember correctly). Pegasus didn't get used much, and took most of the hits from the Basestar fire, which made me incredibly happy due to my personal goal (Cylons Win And 2 or fewer Galactica locations are damaged). I was starting to get worried when 2 Galactica locations were damaged; post-Sleeper phase, I had un-infiltrated and started sitting on Caprica cycling Crises, but I was drawing my blue cards just in case I'd have to hop down there and fix the ship myself. Baltar used a Quorum card to execute Cain in the brig, and she was replaced with Adama (under the "current" rules, so he was guaranteed human). Baltar never Revealed, but Dee did. In the end, the humans had 1 Fuel, 1 Food, 4 Morale, and 4 Population.. Unfortunately they were able to spool up to the "-3" spot and win the game by pushing the button for the last destination-free jump, despite my best efforts. The only crisis that I had seen with "-1 fuel" was also "Admiral Chooses", and by this time, Apollo held both titles. Treachery/Reckless effects did come up a few times in the game, but they weren't all that devastating. Scar showed up all by himself at one point, and was a complete non-entity as the fleet jumped away from him. I really enjoyed playing Leoben, his special to muck with the Destiny Deck is really cool. Battlestar Galactica Character Selection variant. With the release of Exodus, there are now 18 non-Cylon-Leader characters available (5 Military, 5 Political, 5 Pilots, and 3 Support). And without Cylon Leaders, the game goes up to 6 players. 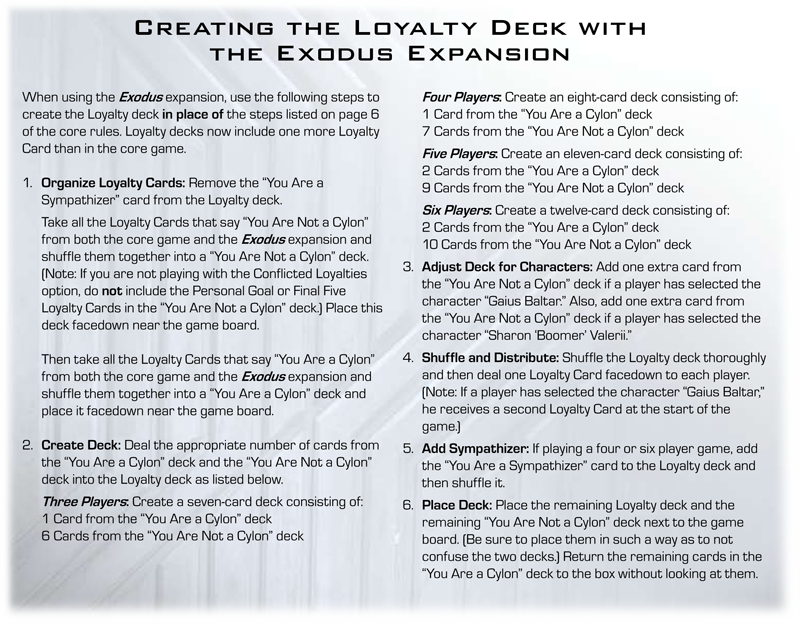 At the beginning of the game, set aside the 3 Cylon Leader characters. Shuffle the rest of the character sheets. B) Deal 3 character sheets, face down, to the player; he chooses one. If he doesn't like any of his choices, he may draw another character sheet to choose from, at a cost of starting with one fewer skillcard at the beginning of the game. You can do this up to 3 times, reducing your starting cards by 1 each time. (If you somehow would start the game with fewer than 3 skill cards anyway, for example being Samuel Anders and going first, then you have to "pay off" this debt with the next 3 cards you would otherwise draw). You may not tell other players which characters you did not choose, by name or special ability. You may only discuss their category (Political, Military, Pilot, Support). For example, "I choose Saul Tigh, the other 2 were Pilots". You may, of course, lie about this, but it's a little too early to be deceptive. Put all of your unchosen character sheets on the bottom of the pile, in any order you choose. Remember that this may throw off the rulebook "balanced character selection" rule, so this variant is not recommended for beginner players. Finally got a chance to play Pandemic with some On The Brink components last night, with the wife. We played an Easy Mode game with the Virulent Strain, then switched to Normal Mode (5 epidemics) for a few more games with the Virulent Strain and one with the Mutation Challenge (but not with both). Overall, it doesn't seem like the OtB additions have an enormous effect on the 2 player game. Maybe it was just lucky draws, but the only time the Virulent Strain ended up having a significant effect on us was when I was playing the Dispatcher (can move other pawns around) and she was playing the role that auto-removes a cube from a city with 2+ cubes, and we drew the effect that you can't leave a virulent city without using an action to Treat it. So I couldn't move her pawn through certain cities anymore. In the one game we played with the Mutation Challenge, we did lose, but the purple cubes had very little to do with it. There was never a point where purple cubes spread out organically, only popping onto the table from card plays. The point at which we lost the game (which was the case in most of our games) still does feel a little bit anticlimactic. But what can you really do about that? You have to go into this game understanding that the game just stops at a certain point. I don't count that as a huge negative, but it is a change from other games. Another minor negative is game setup time. Whenever you start or restart the game, you have to pull out a whole bunch of cards from the player deck, sometimes pull out cards from the infection deck, reshuffle things, deal cards out, and then reshuffle one or two more times. That can get more shuffletastically annoying than Dominion, and I'm thinking maybe I will have to sleeve the Pandemic cards after all. I'd love to give the game more of a chance, especially trying it out with more than 2 players. And the Bioterrorist looks like a spicy little variant too. I definitely rate it at least a GRRR. After this one, I think I'm going to put up a poll for the actual pre-Exodus game we're going to play. Roll a die. On a 4 or less, draw and destroy an additional Civilian Ship and the Fleet jumps a distance of 0. Otherwise, the Admiral draws one Destination card and resolves it. Simple as that, sort of like a (modifiable) 50% chance of drawing a worse version of Misjump. Is this too strong for a Cylon Cain, though? But, at the beginning of the game, put her aside. She cannot be chosen. When a human is Executed, you may choose Cain as normal, amongst all of your other choices of replacement character. Simple as that; of course, it might lead to a whole category of "set aside at the beginning of the game" characters. But since the replacement for an executed character now gets a Loyalty Card, it's plausible. Like I said, this might be moot because of other rules in Exodus that we haven't seen yet, or (less likely) this might actually be the rule. What do you think about these particular apples? Blind Jump - Action: Once per game, if at 6 or less distance, draw 2 civilian ships and destroy them to immediately jump the fleet (even if the fleet marker is on a red space). The Admiral puts the top card of the Destination Deck aside (without looking at it), and draws the next card from the Destination Deck. After resolving the jump, put the set-aside card onto the bottom of the Destination Deck (without looking). It makes me really sad when the consensus on a beloved game is that a certain house rule is absolutely necessary to maintain balance and/or fun. The latest victim here is Battlestar Galactica and our dear Admiral Helena Cain. I was trying to get a group of people together to play a game, with the Pegasus expansion, in an as-unmodified-as-possible state, but was met with resistance on the issue of Cain. Her Once-per-Game ability is the "Blind Jump": Blow up 2 random Civilian Ships to jump the ship as an action, to whatever the top card of the destination deck is. All other things being equal, it counterbalances her penalty, which is that she can't push the FTL button or use the Engine Room. The imbalance arises because of the action "Launch Scout". It's a purple card, and she draws as many as 3 purple on her turn, so it's going to happen. So, she can look at the top Destination Card, leave it there, and significantly lower the risk of the Blindness of the jump. It may still take a few actions to find the perfect destination, but as long as she's proven herself to be human, the rest of the group is probably going to be agreeable to cooperate in scanning for good places to go. That's the background. Most BSG players are well-familiar with the issue. In addition to the fact that she's top in the order of succession to be Admiral, it does kind of make her a no-brainer choice, compared to Adama and Tigh's abilities. To be honest, I don't mind this being the case, but I can see why people demand balance. It would make me happier to get Official Errata, or some sort of clever in-game fix in the Exodus rules, than to have to resort to choosing one's favorite house rule fix. The commonly-accepted "fix" to Cain seems to be to shuffle the Destination Deck (possibly except for the bottom card, in order to keep another ability useful) when she uses her ability. The thing I don't like about this is that the previously-skipped destinations go back into the mix and that's a larger change on the game. By nature of it being a Blind Jump, you simply don't let Cain Blind Jump while she knows what the top card of the deck is. That is, when she looks at the top card, she gets a marker. When the top card goes away, she drops the marker. If she has the marker, she can't use this ability. That seems to me like it would have the least impact on the rest of the game, and wouldn't affect Cylon Cain's decision to never use the ability, for example.